Our crew extracted the water and removed the mold for this satisfied customer. 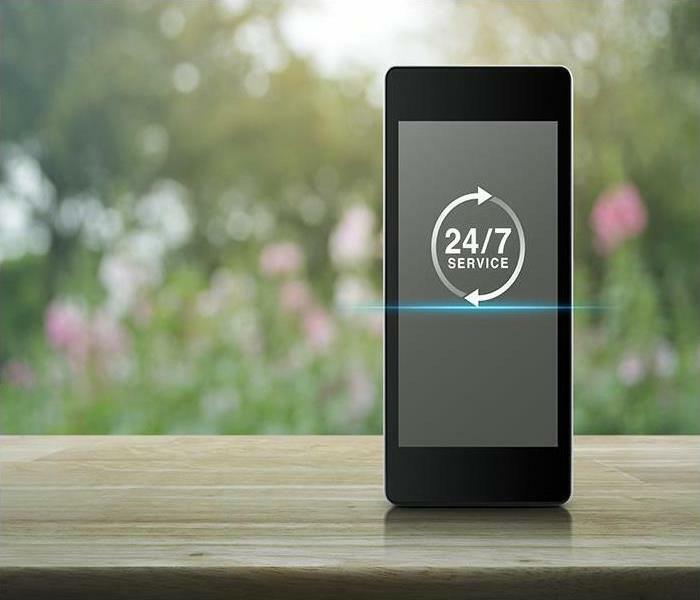 We are available 24/7 so don't hesitate to call right away. Local restoration providers like ours are the first point of contact for residents who need assistance after flooding in their area. Anything can contribute to a flood but, regardless of the cause, the need to remedy damage and remove water quickly is essential. We offer the community an expert, efficient service to help get their home back to preloss conditions after a water emergency. Over the years we have refined our output to suit the requirements of the community after flood damage in Littleton. In extreme cases, our team can pack out your possessions and relocate them to a nearby facility. This process can help to restore your property quicker, limit the damage as well as the opportunity to use ultrasonic cleaning equipment or Esporta washing machines to restore possessions. In the majority of cases though, a flooding issue can be contained to a single area of the home. SERVPRO can then cordon off this area using physical barriers and move possessions into a designated clean room on site. An onsite procedure from start to finish is frequently more efficient than removing items from the site but still allows us to access critical areas of the property without obstruction. When flood damage is the result of heavy rainfall or flash flooding there can often be debris as well as a microbial impact to consider. Typically, water from a flash flood has traveled a long distance, picking up a range of different microbes or pathogens along the way. SERVPRO technicians are trained in the safe removal and disposal of BioHazardous substances and can demolish sections of drywall that may have been infected by harmful bacteria; keeping your home clean and safe to inhabit. SERVPRO uses an approach honed over years of experience in dealing with flood damages. First, we remove excess water using submersible gas pumps or water extractors. Then, we can adopt a targeted drying approach using dehumidifiers and rapid air movers to clear cavities as well as control humidity levels. Finally, we thoroughly deodorize the site using thermal foggers. The combination of these methods allows us to make the damage, "Like it never even happened." Trust a professional service with your property and possessions, contact SERVPRO of Marlboro / Concord at (978) 386-9868 today. Online Vehicle Registration Renewal is easy, safe and secure click here for more information. Sometimes disasters that can affect your Marlborough restaurant remain isolated to one area or another. While this might help regarding the efficiency of restoration, it can also put certain items and elements more at risk than even a widespread situation would. Sprinklers are spread throughout your entire restaurant to suppress fires as they start, but when these systems malfunction or become damaged, they can spread high volumes of water through specific regions of the restaurant such as your dining area. Protecting your investment in this area of your business requires a fast response from trained professionals. There are many materials within the dining area of your Marlborough eatery that after a fire instantly become at risk when exposed also to water damage like a broken sprinkler system allows. This flow of water can spread quickly across the floor, saturating carpeting, seating, tables, and booths. If not adequately extracted and dried, these saturated areas can begin to swell and distort, ultimately requiring removal and replacement. 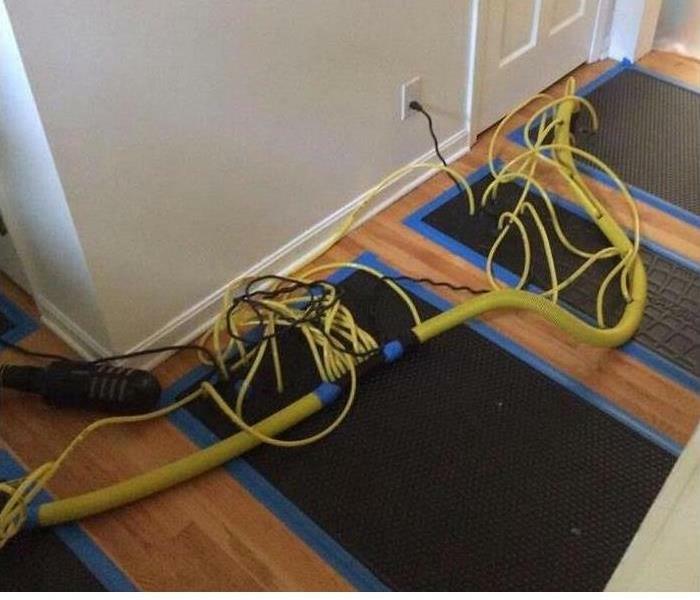 Our SERVPRO professionals can respond quickly to emergencies like this with fast extraction equipment and high-powered drying tools. Smoke odors are never an inducement to good dining, so count on us to immediately place hydroxyl generators for neutralization. From the time that our professionals arrive at your business, we can work on assessing the full scope of the water damage by using moisture detection and thermal imagery. These steps can occur alongside our extraction efforts which would include the use of our portable sump pumps or wet-vacs with extraction wands. We can even utilize our remote-controlled weighted extractor to force moisture from carpeting and subflooring. Hidden moisture can typically be found in the hollows of seating booths. 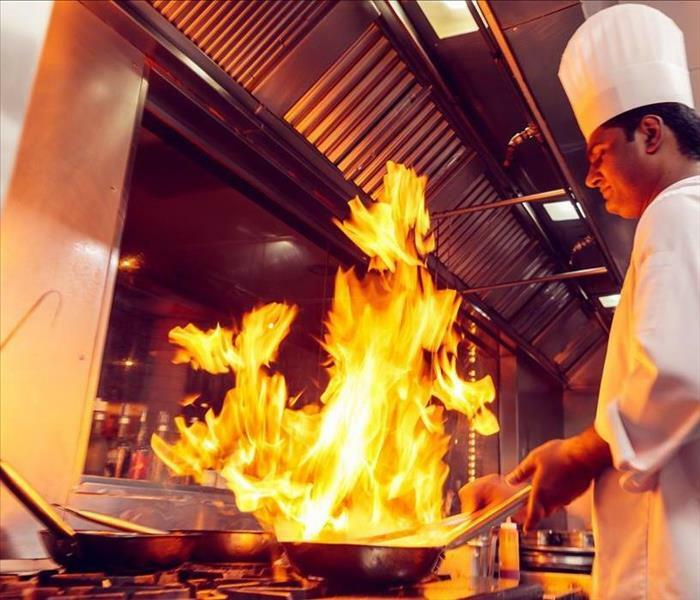 The line cooking section of the restaurant usually is equipped with a dry powder fire suppression system in the even of flareups. Water splashing onto hot grills and pots can endanger the cooks and spread the flames to a broader area. This is another specialized cleanup that our trained SERVPRO techs can accomplish to keep your doors open for business. Fire affects different areas of a restaurant in various ways and we must be flexible to deploy the right equipment and efforts for an effection fire damage restoration. Drying out the damaged areas is not always starting equipment and leaving it to do its job. We must monitor the moisture levels of exposed and saturated wood elements like the booths and some flooring to maintain a specific moisture level. Wood naturally carries a set moisture content, and overly drying can be equally detrimental to the appearance and functionality of the material. Many steps are necessary to recover the dining area of your restaurant after a water loss incident. Let our SERVPRO of Marlboro / Concord rapid response team help you make this damaging situation “Like it never even happened.” Give us a call today at (978) 486-9868. Come and visit where everyone in NE meets, click. Many Concord homeowners mistakenly believe that when a fire occurs in their home, the damage that can result stops when firefighters work to put out the blaze. While some of the potential effects like an immediate structural compromise could get resolved by putting out the fire, many other effects continually impact your property, even stretching far beyond the combustion site and the immediately affected areas. 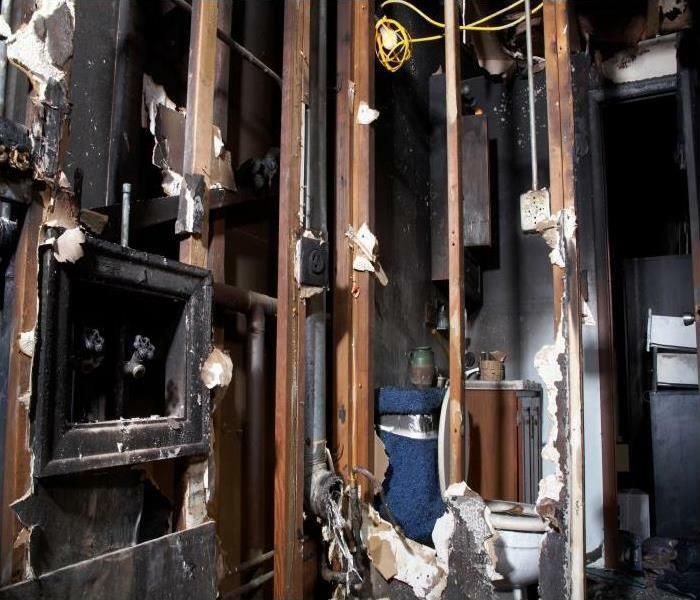 Our professionals have extensive training in fire and smoke damage recovery, making us a wise choice to address all of the lingering concerns after an emergency. Homeowners might not understand the full extent of the possible fire damage to their Concord home even after the disaster, but our professionals do. With a full damage assessment that begins every restoration project that we undertake, our SERVPRO team can determine the entire extent of the fire effects and the best approach to restoring soot and smoke residue, indoor air quality concerns, secondary effects from extinguishment, harsh odors, and other detrimental hazards. Soot and smoke damages are a common staple in fire recovery and restoration and can be an obstacle for even skilled technicians like ours. With effective cleaning equipment, we can remove the bulk of the residue and sediment on surfaces before we work with dry and wet sponging to clean the remaining residue from materials and contents. A misstep in the cleaning process can lead to staining of the affected surface, so our SERVPRO technicians take as much time as necessary to fully recover these damaged materials and contents. Indoor air quality concerns can often get resolved with the use of effective filtering equipment like our air scrubbers, hydroxyl generators, and ozone machines. With effective HEPA filtering of debris, ash, soot, and smoke residue from the environment, air quality can improve continually with the prolonged use of these units. The hydroxyl generator and ozone machine can also be effective in removing harsh odors from open areas. 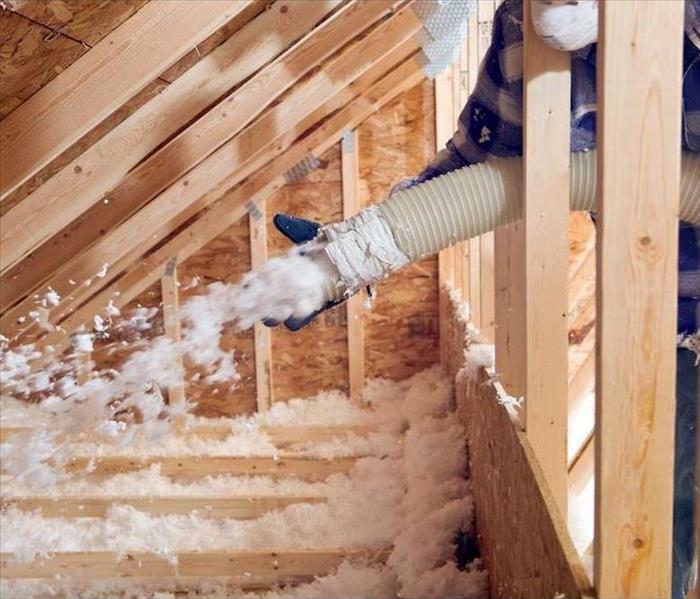 When the insulation in your attic gets wet, problems such as mold damage can occur. Contact our team to investigate the extent of the water damage. Thunderstorms can bring intense winds and rains to your home, but they can become disastrous and cause flood damage inside of your home when the roof above you is sporting a hole. Over time, roofs become weathered and damaged. With enough time, those damages can become extensive and lead to holes forming as the shingles rot away. Getting your roof replaced is expensive, but pushing it off as long as possible can cause more problems, such as rain pouring through a hole and into your home. The water from flood damage inside of your Littleton attic soaked the insulation and wooden structure inside. Some of the water even traveled down to the structure of your house, causing bubbles to form in the paint covering the walls in your living room. In this situation, the best thing to do as quickly as possible is to call someone about the hole in your roof as well as calling for professional water damage remediation services. When you get in touch with SERVPRO, we make sure to send our technicians to your home as quickly as possible. After a brief investigation, our technicians may decide it is best to remove the soaked insulation, especially if this is not the first time rain has gotten into your home and there is evidence of mold damage. Afterward, SERVPRO can create a drying plan and then begin to set up equipment in your attic, meant to create an ideal environment for evaporation. SERVPRO can set up axial fans, air movers, and dehumidifiers in the attic, devices that work in conjunction to remove moisture from the air, as well as to introduce fresh and dry air to the area of impact. Where water slipped down to your living room, we can feed air blasting tubes down through the walls, from the attic, to ensure that the space between your walls is also adequately dry. If sudden flood damage impacts your home, get help immediately. Speak with SERVPRO of Marlboro / Concord by dialing the number (978) 486-9868. Day or night, our technicians are always available to help you. Click here for more information about the city of Littleton. After A Pipe Has Burst In Your Concord Church, Call The Professionals At SERVPRO! Let our SERVPRO of Marlboro / Concord rapid response team help by calling us whenever disaster strikes at (978) 486-9868. While many Concord residents and those responsible for your church believe that burst pipes only typically occur during the harsh winter months, this is not the case. 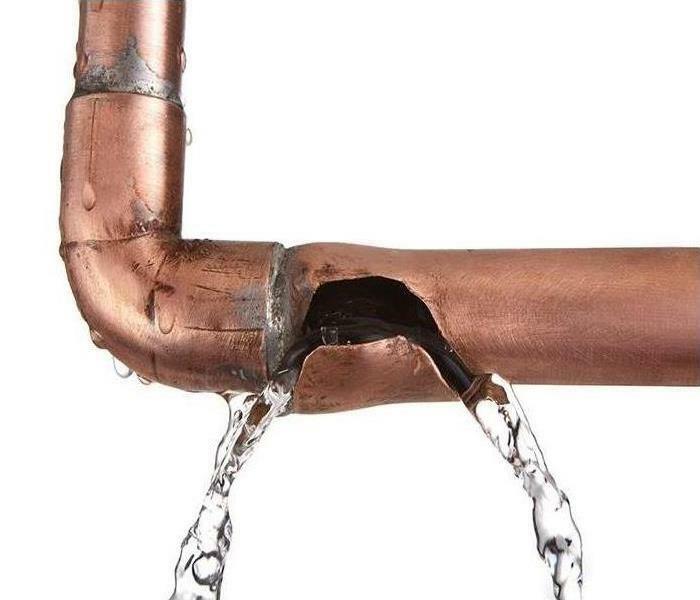 Many conditions can allow for pipes to break and burst, and many of these include weakening of the metal plumbing on account of scaling, buildup, or rust affecting the inside and exterior of the pipes themselves. Breaches caused by any of these conditions can occur at any time of the year, so keeping yourself informed about the conditions of your plumbing and where repairs could be necessary is advisable. Unfortunately, you might not regularly inspect the plumbing and individual pipes of your church, primarily because many of the portions of this network get hidden behind walls and underneath flooring. Whenever a pipe does burst, responding quickly to the situation can help to keep the damage from getting out of control. Our SERVPRO team offers a 24-hour response to emergencies, ensuring that all of our customers have access to the full measure of our restoration and mitigation tactics regardless of when disaster strikes in Concord. This assurance begins with our fast response to the situation with leak detection equipment that can identify the point of the break and allow our team to remove the materials around this portion of plumbing exclusively. This fast identification of the source can allow our technicians the opportunity to repair the damaged portion of the pipe and get started on other mitigation tasks designed to preserve affected materials. Our SERVPRO team aims to preserve damaged and saturated materials instead of tearing out and reconstructing. This practice can ultimately save our customers money and time by restoring saturated materials like hardwood flooring, carpeting, and furniture. When pipes burst inside of your church, you want to ensure that restoration work can begin quickly to remain available to your congregation and their needs. Let our SERVPRO of Marlboro / Concord rapid response team help by calling us whenever disaster strikes at (978) 486-9868. Call our specialists any time 24/7 we are ready to fight the mold damage in your home. We have the right equipment for any job big or small. While it occurs most commonly throughout the winter months, attic mold can happen in your Concord home any time of the year. With so many homeowners never using their attic space or checking on its condition regularly, this is a problem that can quickly get out of control without professional intervention. 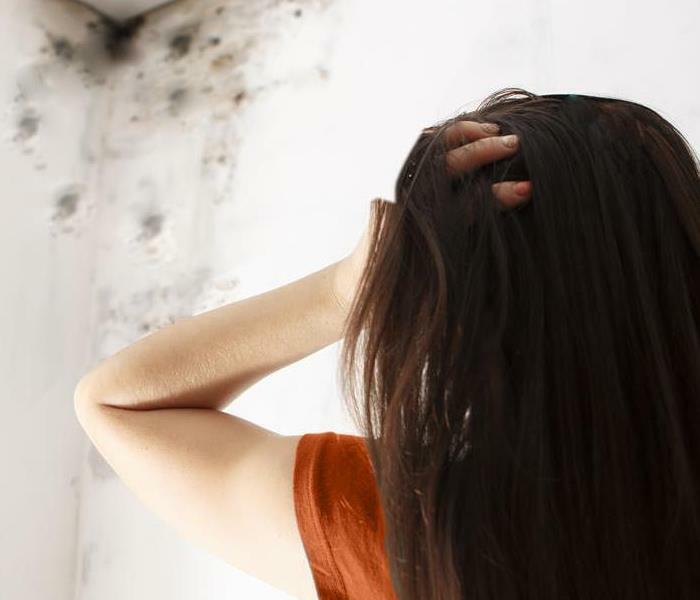 Unfortunately, many of these same homeowners do not recognize a mold problem until it has begun to affect the floors below the attic and in dire need of immediate remediation. While you might not have a good idea of when mold in the attic of your Concord home could occur, damage to your home’s roof is often to blame. These vulnerabilities are particularly exploited in freezing temperatures when thinning insulation can allow hot spots to occur on your roof and melt snow when the temperature is still well below freezing. The result is flash freezing, ice damming, and damage to the shingles of your roof which can allow snowmelt to create a damp environment of your attic. When our SERVPRO team gets notified of mold growth in your home, we can arrive quickly with the personnel and equipment to make a difference. Our IICRC certified remediation technicians can contain the colonization to prevent further spreading throughout your home while we get started on the removal of the growth. When we address mold growth occurring in the attic of your home, we also have to identify the penetration points for moisture coming through the roof. Moisture detection and thermal imagery can help determine where these hot spots are and direct our contracting division where reconstruction or repairs must occur to prevent further damage in the immediate future. While regular inspections of your attic space might help to prevent widespread mold colonization in this area, most homeowners do not recognize a problem until it requires our experienced approach to resolve. Give our SERVPRO of Marlboro / Concord remediation specialists a call anytime that you need us at (978) 486-9868. If you are looking for a hiking trail in Concord click here. Since your clinic moved into a space just big enough for all of your equipment and necessary examination rooms in the Concord business district, you had to utilize all of the available space out of the immediate main floor for storage of records and documentation in hard copy form. As promising as the basement area of the building seemed to be for the boxes of records, the aging blockwork has provided perpetual dampness and moisture that could threaten these documents. Our professionals can help. As simple as it might seem to deal with a wet basement in your Concord clinic, there are some severe consequences to perpetual dampness that extend far beyond the records that you are keeping there. Dampness can allow for the production of mold, and with the cardboard boxes of paper records and documents, it does not take long for the spores present in that environment to seat into these materials and damage them permanently. Our SERVPRO professionals can help you to protect these records and to resolve the wet basement issues. From the time that our professionals arrive at your facility, we can get to work quickly on identifying the source of the moisture in the basement of the clinic. This process can help our team to determine what can get done to prevent further dampness, whether that is sealing up penetration points in the blockwork with hydraulic cement or installing permanent equipment like sump pumps beneath the concrete floor of the basement to divert water from leeching up through the concrete. 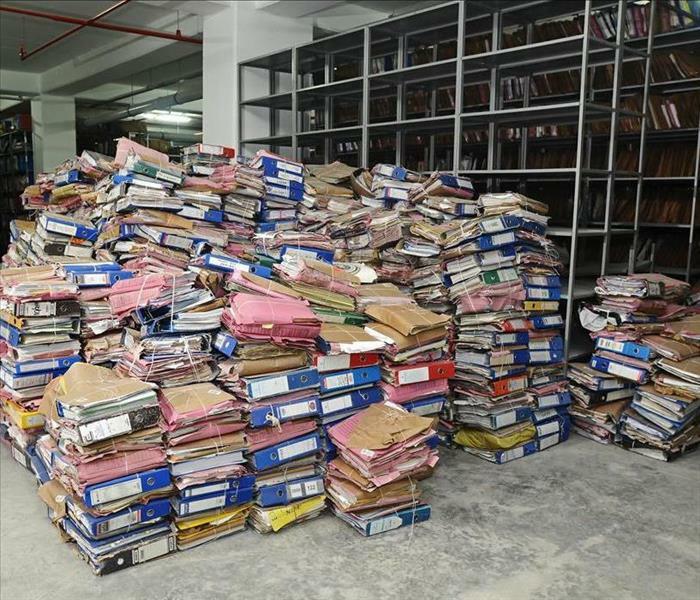 To protect your documents, our contents department can remove them to the safety of a nearby facility of ours until the wet basement has gotten resolved. Our SERVPRO professionals on-site can set up air movers and dehumidifiers to quickly remove the moisture from the affected areas and monitor our progress to ensure that our long-term solutions remain effective at eliminating the penetrating water. We may suggest installing a permanent dehumidifier to maintain a steady Relative Humidity. As vital as your clinic is, many patients might become uneasy at their records becoming destroyed by mold colonization or water damages. Let our SERVPRO of Marlboro / Concord restoration technicians help you to preserve these vital documents and the structural integrity of the building. Call anytime that you need us at (978) 486-9868. Travel guide for this city right here. As a part of training, most of our Technicians and Crew Chiefs attend courses relating to the Institute of Inspection Cleaning and Restoration Certification, otherwise known as the IICRC. 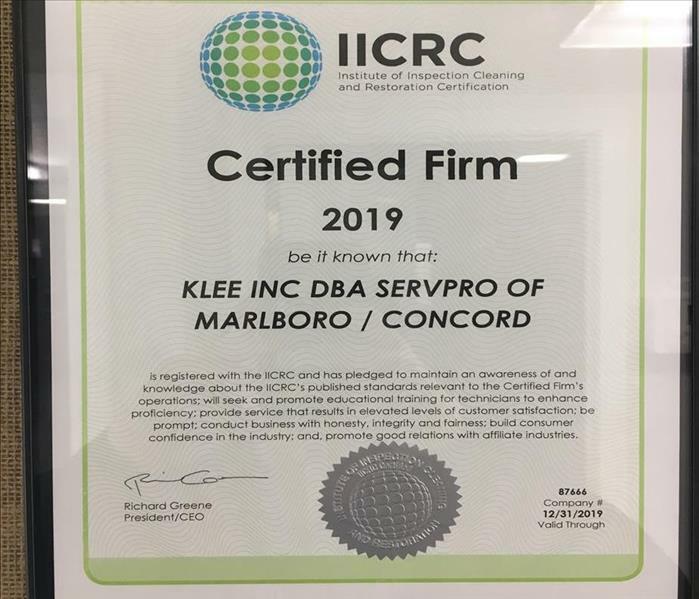 SERVPRO of Marlboro/Concord is a fully certified firm and even offers in-house training courses for all individuals who proceed to work with our company. The IICRC was founded in 1972 and is now a globally accepted institution that gives the necessary training and certifications to those who desire to work in the cleaning/restoration and or inspection industry. The IICRC is a vital institution that is required by most companies now to demonstrate to our customers that we are prepared for any disaster that may come their way. The IICRC handles safety concerns, leadership qualities, and the protection of our valued customers. The IICRC allows for technicians to utilize the proper equipment in the right way by assuring the safety and security of our ourselves and our customer first. Certifications from the institution give these individuals a higher standard of responsibility, safety, and concerns when it comes to the customer and the procedures that we practice. Technicians that achieve certifications through this training have acquired integrity, leadership, and core values leading the customer into a trusted and secured relationship with our SERVPRO brand. We strive on exceeding expectations and providing our customers with the best services possible. By affording all of our Technicians and Crew Chiefs with this exposure and training in this niche restoration and cleaning industry, we can reach these goals of mutual respect and understanding from the customer and ourselves. Many of our employees have multiple certifications from the IICRC, in all different areas of cleanup and restoration. Some of these honed skills include Water Damage Restoration WRT, Fire and Smoke Damage Restoration FSRT, Applied Structural Drying ASD, Lead Safe Renovation RRRP and many more. Having team members that are well-rounded and trained in all aspects of restoration and recovery are the differentiators that make us stand out from other companies. Our SERVPRO of Marlboro / Concord rapid response team is available 24/7! For as many homes throughout the Concord area that contend with moisture in their basements, it is not a far stretch to find that many of these same lower levels are susceptible to flooding in the right conditions. With finished basements, this level beneath the main floor of your house is now a livable space and has many construction materials and contents that could become irreparably damaged very quickly when battling rising waters. With the wide array of flood damages that can occur to your Concord finished basement over a brief period, you need fast acting mitigation services that can respond amid the disaster to effectively lessen potential losses. Our SERVPRO experts are available 24 hours a day to continually be ready for any disasters that could affect our communities or individual properties throughout our service area. With flooding, there is a finite timeline to prevent more pressing concerns like mold growth from developing. From the time that our experts arrive at your address, our initial focus becomes extraction, cleanup, and material removal. Extraction is key because many of the construction materials unaffected when we arrive could ultimately become damaged without the fast removal of pooling water from this lower level of your home. We have truck-mounted pumps and gas-powered pumps to effectively remove floodwaters and move on to other mitigation steps such as pack-outs and controlled demolition. While flooding in your home might be something that many area residents are mindful of, the effect on a finished basement requires immediate action from trained and certified restoration specialists. Our SERVPRO of Marlboro / Concord rapid response team is available 24/7 by calling (978) 486-9868. T’is the season! No, not the season for holidays, and cookies and gatherings; but the season of frozen pipes! Frozen pipes have once again ignited a spark in our community of due to the numbing New England weather that has been occurring. Frozen pipes can happen to anyone living in a Marlborough house, especially when you least expect it. 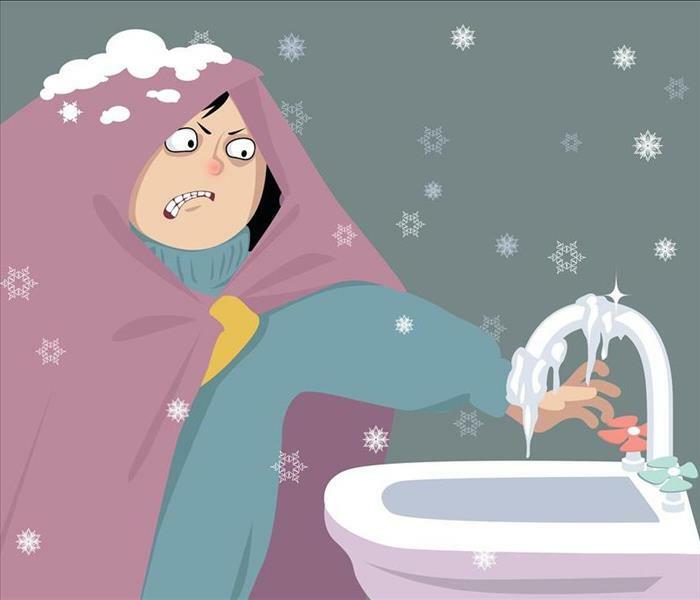 It is vital that you prep for the winter storms and the weather by taking the necessary steps to stop the pipes from freezing, causing the pipes to burst. As the pipe begins to freeze, the water inside the pipe begins to expand which causes pressure along the inside of the pipes, leading it to burst. Most often or not, this burst occurs at the weakest joints of the pipe. When a pipe freezes, all of the water inside of the pipe will begin to flood throughout your residence where the pipe broke. Moreover, trust us, nobody wants that. Luckily, SERVPRO always is here to help when you have a disaster like that occur. We have crews readily available to serve our customers at any time of the day because we never can plan for a disaster to happen, but we can be there when it does. SERVPRO has the necessary equipment to initially extract the standing water that flooded into your residence because of the pipe burst. It is important to turn the valve off and completely turn off the water for it to stop draining more water in. Once the source is completely stopped and evaluated, we can continue the drying process. When it comes down to it, however, no one wants to spend unnecessary money on something you, yourself can help prevent. Here are a couple of steps you can take to prevent frozen pipes in your house. 1. Check your pipes monthly. Secure the pipes with an insulated cover to keep the pipes warmer than freezing temperature. This will allow the water to run through the pipes without any blockage smoothly. 2. During those bitter cold nights, you can place a space heater in front of pipes that tend to be in more colder locations, like the pipes under your sink, or the water heater down in the basement. 3. Constantly keep the water trickling to prevent the water from stopping and freezing within in the pipe itself. 4. Unattach the hose from the exterior of the house so the water can properly drain outside of the house. 5. Set heat on hold to a temperature higher than 55 degrees in the residence, so the pipes never reach the freezing temperature. 3/4/2019 - After A Pipe Has Burst In Your Concord Church, Call The Professionals At SERVPRO!